The fire station just down the road from us has a helipad which hosts the local air ambulance crew. My kids love to look for the helicopter when we drive by. A particular highlight is if we happen to drive by as it’s landing or taking off. The helicopter has become part of our daily lives as we see it flying overhead and run outside to see if it’s heading out or coming home. When the kids were just old enough to start learning about prayer, I suggested we pray for the helicopter anytime we saw it was away from its base. So, whenever we see the helicopter is out we say a quick prayer in the car together for the people the crew is going to help and safety for the crew. We’ve also added prayers anytime we see a fire truck or ambulance go by with lights flashing. God, please go with the helicopter and keep the crew safe. Give them strength and power to help those in need. Be with the people the helicopter is going to help. Give them healing and wrap them in your love and support. The helicopter is a quick reminder to pray and it’s a way to teach the children about prayer. Using everyday sights as prayer prompts has been a simple way to weave more prayer into our day. While it may not be a deep connection to say a quick prayer as we’re driving, it has deepened my overall prayer life by putting prayer into my mind throughout the day. God wants us to include Him in our thoughts and decisions, to allow Him to enter those conversations that roll around in our minds. For me, the car is where I have most of my internal conversations. Those discussions that seem to bounce around my head, the place where worry and debate are most intense. Being prompted for some basic prayers for our first responders also serves as a prompt to invite God into my internal conversation. What do you see often throughout your day that can serve as a prayer prompt? 1) Choose something you see frequently throughout your daily routine. It can be something you love, something that reminds you of a need, or even something that frustrates you. Just choose something you’ll see often and will serve as a reminder to pray. 2) Decide a quick prayer you’ll say each time you see it. This doesn’t have to be a set prayer, just give yourself some kind of guide. Maybe you’ll pray for someone on your prayer list, pray for safety and healing, pray for thankfulness, pray for strength, pray for guidance, pray for God to reveal Himself more fully in your life. 3) As you see your prompt throughout your days, just say a quick prayer in your mind or aloud if you want to make it a family activity. Don’t worry if you forget, just try again the next time. It may take some time to develop a habit, but if you keep trying it will become a habit. 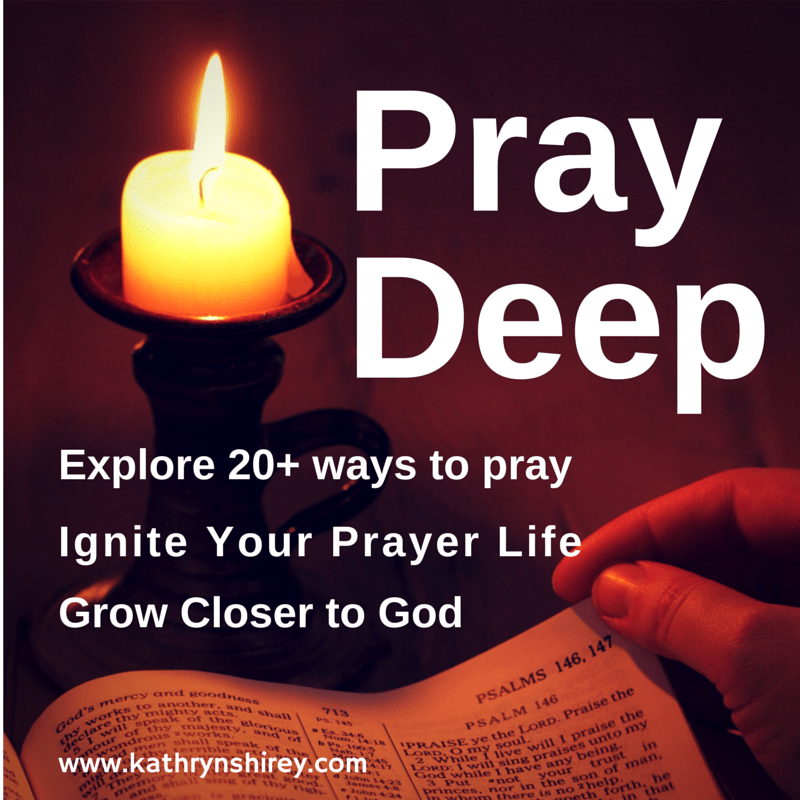 Pray Deep Challenge: Choose an every day prompt to remind you to pray. Decide what you will pray when you see your prompt. Then, begin to pray as you go through your day. Get your family involved, too! It’s a very good idea. As you said we may forget sometimes but as we keep doing it , it will become an habit. I will definitely give it a try. Thank you for sharing.